I know it's always called Swinging, but this is my take on that famous decade! 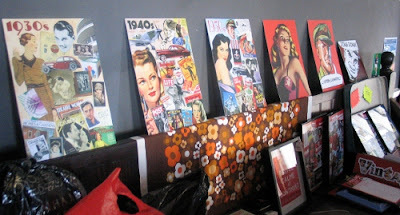 As with all the Decades series, every item is from my own collection. So all those magazines, photos, books, records, stamps and tea and coffee canisters you see have all been painstakingly sourced, scanned in and messed around with in Photoshop especially for you!! If I find something else, I'll add that too, so this may not be final version! It will now be available to buy as cards, framed pictures and A3 mounted posters. 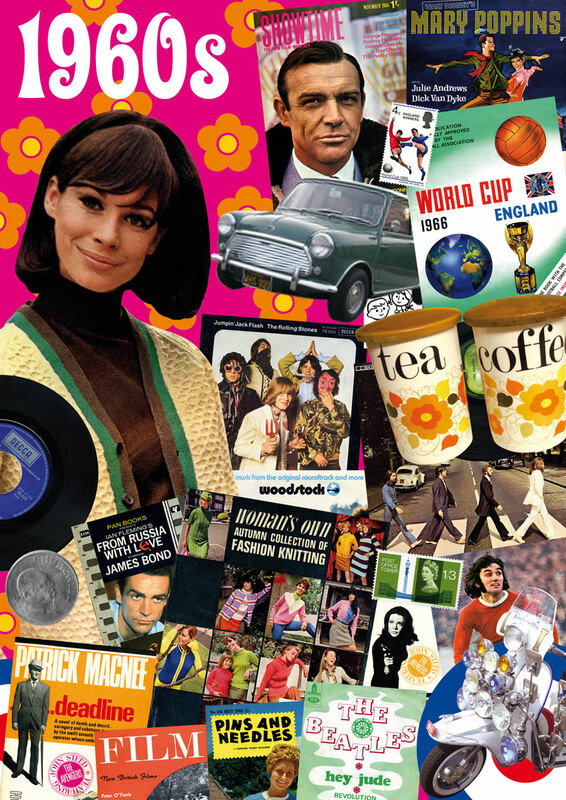 And now onto the 1970s...........phew, more hunting around markets and in my loft for stuff!!! 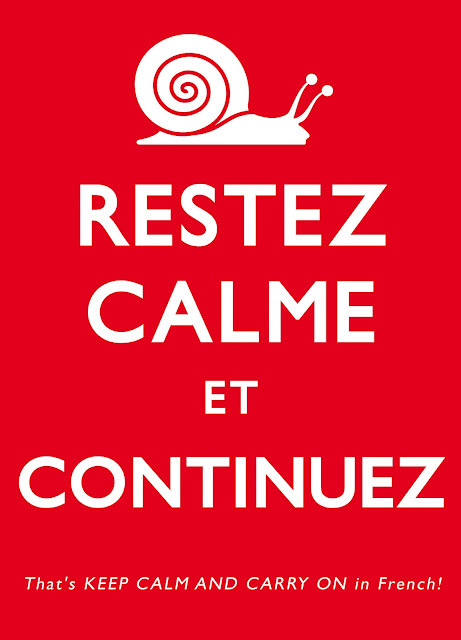 The whole world has now seen the famous wartime poster KEEP CALM AND CARRY ON but have you ever seen it in French?!! Impress your friends with your knowledge of French! It comes with a handy translation at the bottom in case you forget, and is completed with a cheeky escargot at the top! They already proved a hit at my last fair at the Railway Hotel and can be bought as cards or as framed pictures. They also come in blue, to carry on the French theme! Come along to my next fair at Leigh Community Centre on June 25th to grab one for yourself, or if you can't wait that long email me to get one sent to you! 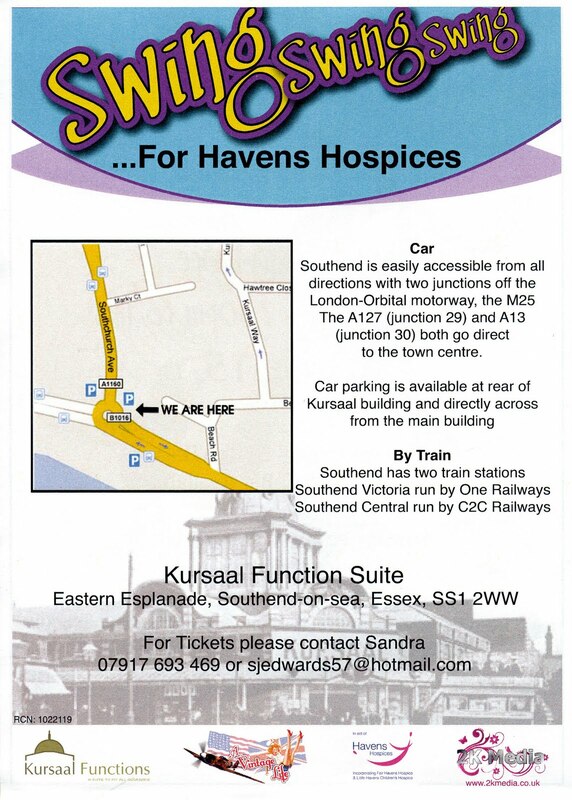 I'm delighted to announce that I will be at the 40s SWING DANCE charity event at the Kursaal in Southend-on-Sea on 8th July. 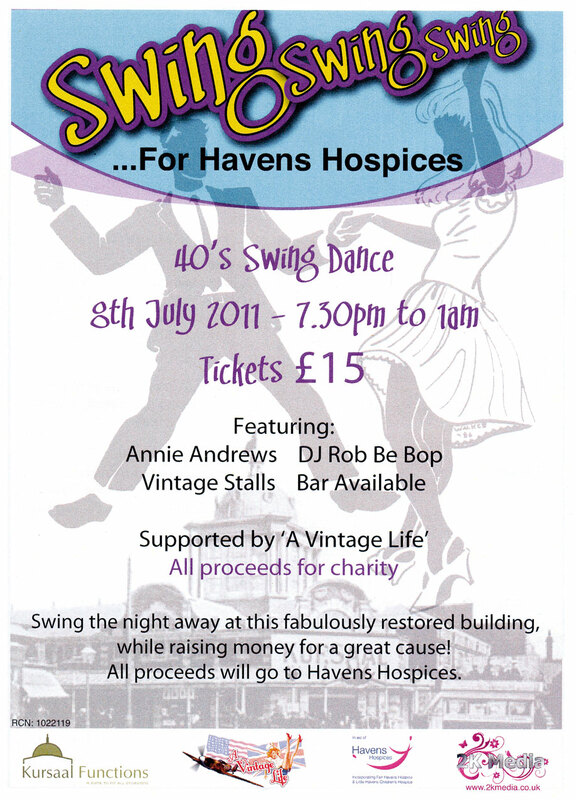 This fabulous evening is in aid of the Havens Hospices. There will be DJs, great 40s music and vintage stalls in the iconic Southend building, so come along for a swing knowing it's all in a good cause! The night starts 7-30pm and ends at 1am, so plenty of time to browse the stalls and have a great time dancing the night away! 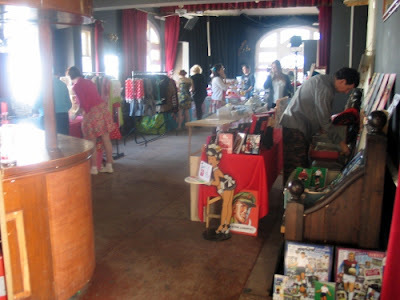 Last Sunday's NOW, VOYAGER CRAFT AND VINTAGE FAIR was another great day! 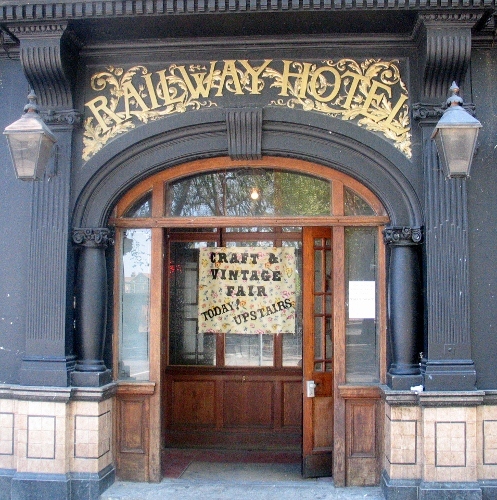 The Railway Hotel is a fantastic setting for a vintage fair, a beautiful Victorian pub. Had loads of space to set up everything and even had a comfy bench to sit on! Lots of great people came along and thanks again for all the positive feedback. 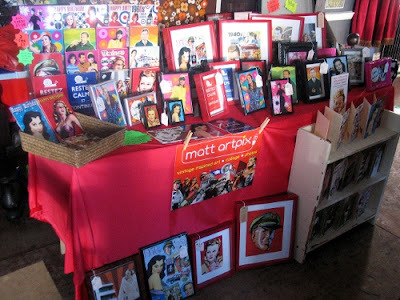 My brand new card stand was especially handy, everyone could see them all on display. 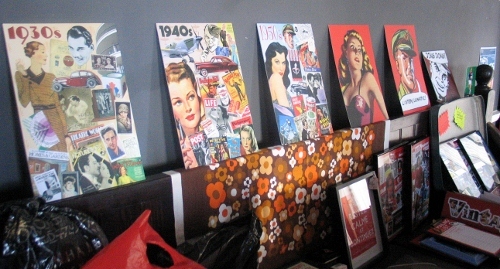 My new designs went down well, which was great. Pre-match preparations going on... notice the comfy bench I mentioned! Phew! Stall is finally set up! The new card stand makes its debut! 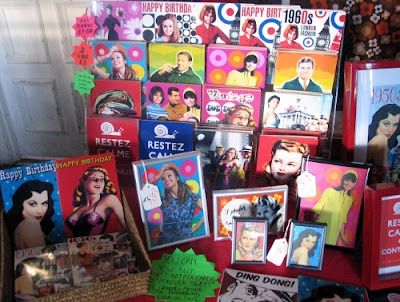 Dazzling Decades on display! And check out the groovy 70s tablecloth, thanks Mum!